This has been a busy blogging time for me! It’s the fall time with winter coming and I find there’s more to cook (dare I say bake) at this time of the year. At least for me. I’m not a huge “dessert” person but people in my family are. For the longest time I didn’t even dare try to bake anything because I’ve had ay too many fair share of ruin on my end. But I’ve had more opportunity to bake things that are a bit healthier for us so I’ve been giving it a try. 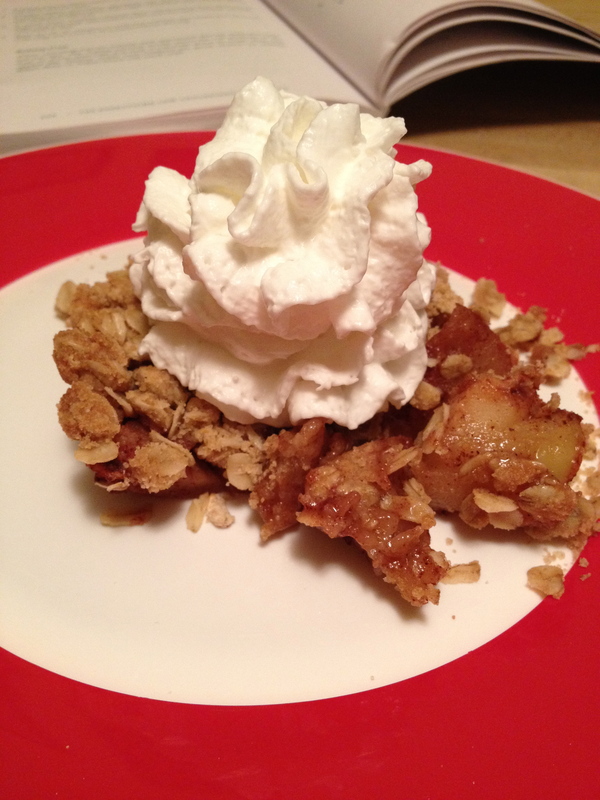 This recipe is actually called Apple Pear-Nut Crisp, but Craig wanted something with just the apples, so I added more apple and cut out the pear. (I’m wishing now that I had either added more apple or used the pear). I won’t call this a failed attempt on my end because it did taste pretty good, but there wasn’t enough fruit in it for us. I felt that this was a bit high in calories for me. If you’re watching what you’re eating, I’d rather use those calories on a “salty” food rather than the sweet food. Since candy is not an option for me I settle for these types of things now to get the sweet from somewhere! Here’s what you need (Yep, this came from the infamous The Everything Low Cholesterol Cookbook). 2. Prepare apples and pears, sprinkling with lemon juice as you work. Combine in medium bowl with sugar, cinnamon, and nutmeg. Spoon into prepared cake pan. 3. 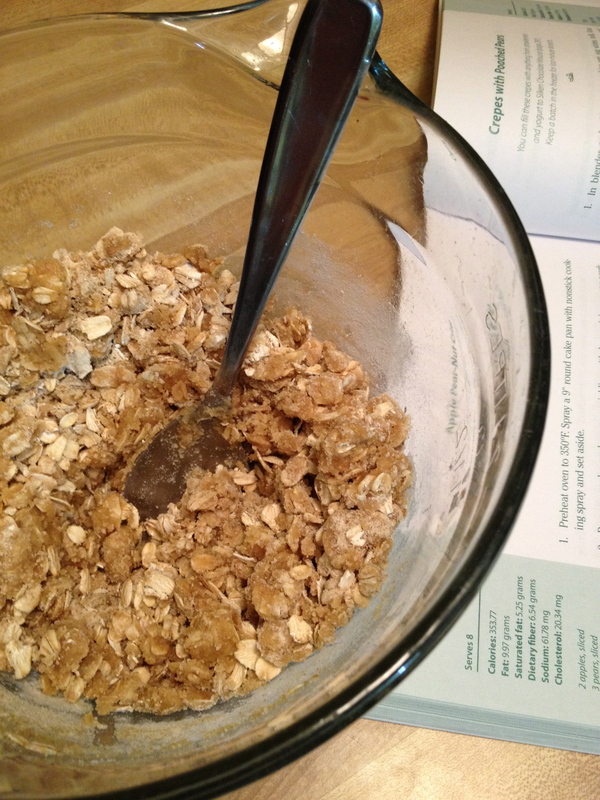 In same bowl, combine oatmeal, flour, whole-wheat four, and brown sugar and mix well. Add melted butter and mix until crumbly. Sprinkle over fruit in dish. 4. Bake for 35-45 minutes or until fruit bubbles and topping is browned and crisp. Let cool for 15 minutes before serving. 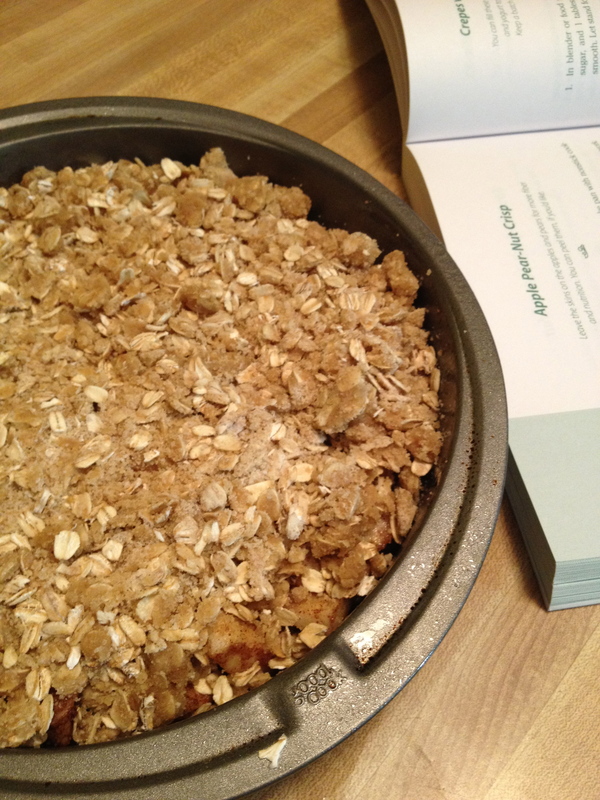 From the cookbook: Leave the skins on the apples and pears for more fiber and nutrition. You can peal if you’d like.